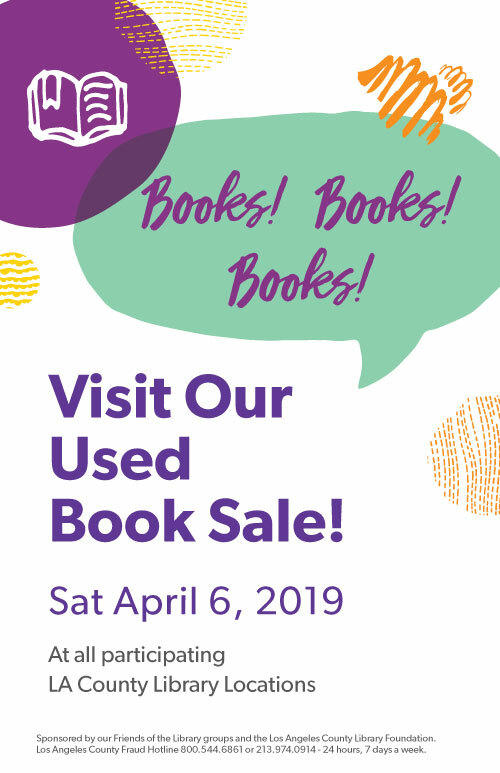 On April 6, our annual systemwide used book sale, Books! Books! Books!, will be taking place at most of our libraries that are regularly open on Saturdays. The book sale is held annually in honor of National Library Week, April 7-13, 2019, when libraries throughout the nation celebrate the importance of books, reading, and library services. The book sale is sponsored by LA County Library’s many Friends of the Library Groups and the Los Angeles County Library Foundation. All proceeds will be used to benefit local library services at individual locations where the books are sold. The size and start time of each book sale varies by location. Check with your local library for details on the book sale nearest you, and stop by to pick up a few bargain books while supporting library services!